ShoeMakers.com uses the very latest Digitoe Technology for imaging the feet and creating Custom Shoe Lasts and Custom Fit Footwear. For more details visit Digitoe.com. The Mobile Fitting Lab offers personal service, privacy and convenience at your home, office, sports arena, hotel, golf course, etc. When will Shoemakers.com locations be opened in my area? This is a question that many people have been asking us. Our answer to this question is, "We are working as fast as we can and we plan to grow our network of fitting centres in balance with our production capacity ." 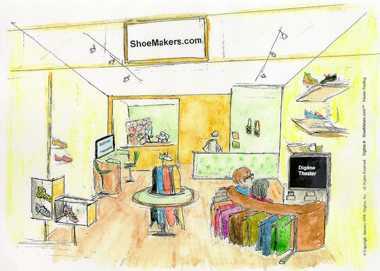 One day there will be ShoeMakers.com Retail Fitting Centres in every major location in the "Global Village". If you are interested in the possibility of growing with us, please visit the Business Opportunity Page. With the rapid development of the Internet, the concept of a Global Village Network of ShoeMakers.com Retail Fitting Centres and Licensed Shoe Manufacturers is a reality. We have had communications from people in more than 40 different countries interested in setting up a Retail Fitting Centre in their own part of the "Global Village". One day, in the 21st Century, you will be able to order your footwear directly from the comfort and privacy of your home, with the 100% assurance that every pair of shoes you order from ShoeMakers.com will fit your foot perfectly.